As another exciting dance exchange in Chepo, Panama is approaching, Movement Exchange at IU has even more to expect. Our team of dance diplomats is full of first-timers, which means aside from spreading pure passion and enthusiasm for the joy of dancing this holiday season, we need to bring ourselves together for a moment of composure to listen to advice from our Panama-returnees—whose 2 to 3 years of Panamanian expertise packs them with nothing but knowledge and immense affection for the land. We sat down with Emma DeLillo, a beloved member of Move-Ex for the past 3 years, to talk about her experience, first impressions of the exchange, and to ask her for some advice for the newbie team this year. We also had a blast talking to Isabel Owens, a new member of Move-Ex ( who also goes by “the traveler” among us), about the adventure awaiting her in Panama this winter break. After speaking to a bit with Emma, it was quite clear that her Panamanian experience was a positive one—she even claims that is was one of the best in her life! Emma is currently a junior at IU pursuing a major in Contemporary Dance and Marine Conservation, as well as a certificate in Underwater Resource Management. She has been a Movement Exchange member since the first semester of her freshman year. In addition, she has been dedicated to many of the Bloomington workshops that Movement Exchange at IU has been involved with. Emma is also somewhat of a world traveler, having been to many countries in her lifetime. However, when sharing about her trip last year, Emma emphasized the special connections she made with the other exchange students, and most of all, the Panamanian people she worked with. Even when speaking two different languages, she was blown away by “the amazing power that dance has to bring people together and form a community”. She explained that not only was everyone very generous and welcoming, but that the children they taught were very receptive to all they had to offer. Isi came rushing in the practice room one Wednesday afternoon to prepare for the choreography that we’ll be teaching in Chepo, cheeks glowing from running late and possibly due to teaching a couple of yoga sessions from the other side of campus. However, she was ready to elaborate eagerly about the adventure, as the traveler that she is. Isi knew about Move-Ex since her freshman year, but was only able to join us since earlier this year since she took a gap-year to see the world (could there be anything cooler than that?!). 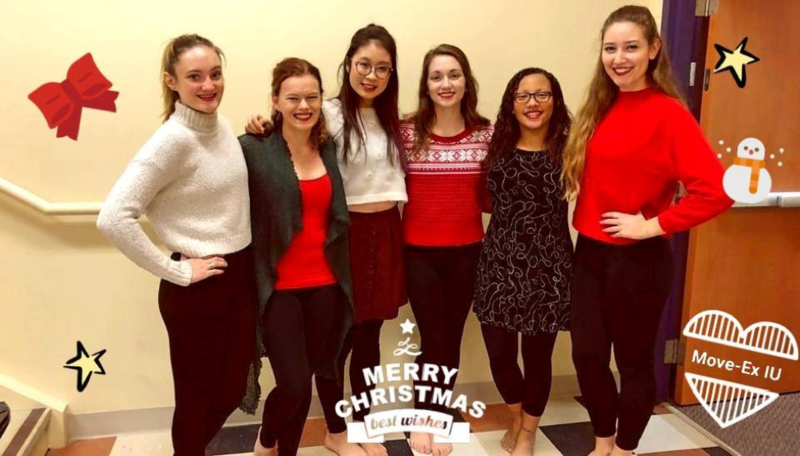 But as soon as her junior year began, Move-Ex had become a routine in her weekly schedule, teaching at Middle Way House and helping choreograph some of the loveliest choreos for our Christmas performance. In answering why she signed up for Panama this year, without a doubt, Isi said, the idea of a dance exchange was an unique way to learn about a new culture, new people with different backgrounds, as well as bridge the differences with something that we are all passionate about: dancing. A Global Health (International Studies) major with minors in Dance and Spanish, the Panama trip seems like it was tailored for Isi. What she’s most excited about is dancing with the kids in Panama. Although she has had a lot of experience working with children prior to this, those experiences were never in a different country in a totally different language. And as a bonus, trying to communicate in Spanish alongside other Move-Ex dancers (and maybe struggling a little bit) is just as worthwhile to expect. The local dance workshops are also equally anticipated, and the food in Panama as well (we don’t blame her for that!). She thought it would be so much fun to learn different types of dances in another country, having tried styles varying from ballet to jazz to hip-hop and even to Bollywood since a very young age. Despite all the diversity that they’ll be experiencing, Isi thought that there is one connection that would overcome all those differences: the universal love of dance and movement. “You can cross cultures, you can bridge differences. Even if you can’t communicate verbally, you can always communicate with your body, a smile or a head nod… you know, positive touch. It will be different, but it won’t feel foreign”. Honestly, the parents are probably more nervous than the explorers are about the trip. As the ones who will represent the oldest chapter in the country to reach out to this whole new culture this year, we are filled with excitement and pride. Isi laughed with us about how she had not thought of packing just yet—as the idea of being on a plane to a different land is just worth to indulge in a little bit longer before the laboring part. Nonetheless, the schedule is quite packed; thus, she will try to remind herself to soak everything in, and enjoy the best of her time there as an ambassador of dance with an utterly meaningful mission to complete.